As my work gains momentum sometimes it’s interesting enough to get an interview. So far all have been with bigger outlets; a work of mine was on the Martha Stewart Show last year, this year the Houston Chronicle picked up one of my creations, and then there is local media on rare occasions and other such showing of my works that I am grateful for. The free boost of my photographs and recipes being passed around is nice, but something struck my heart cords in an interview I just had with a young woman for her college class. It swept me back in time to being a 19-year-old college student myself, working for my university newspaper. I was young, lost, and had no idea where my first camera and I were headed together. It would take another 10 years of grasping before I realized it was food photography which was closest to my heart, and that I wanted to share my work with as many new friends as I could. So, I answered her questions honestly, but in a way that I hope helps her as she comes across some of these bridges. Here are my answers to her questions. If you are on the same path, I would love to know what your’s would be. It took me 4 years of college and about 8 years after that figuring out that I really wanted to focus on food instead of people. Then it took another year of learning how to shoot food well by practicing almost daily, attending food photography conferences, studying food photography books, and learning from the work of pros. 2. What exactly inspired you to become a food photographer? (What was the idea that made you realize that you were meant to become a food photographer? I wanted to first capture human emotion. A split second of time where a burst of energy was recorded through my subjective view, I worked for newspapers early on and started to shoot food there. When the newspaper work didn't pay the bills, I worked in kitchens and after a few years I realized I wanted to shoot my own food and share it with others. 3. What techniques harbor the most success for the majority of your target audiences? Don't follow trends. Make trends. For me, if napkins are all the rage, and everything has to be shot on them, I will refuse. Instead I might focus on something different, like textured placemats, natural light, or low-key shots. 4. What do look for when taking a picture? Food is difficult. I am constantly aware of composition, light, texture, what the food itself looks like, food design and styling, keeping it as real as possible, and then there is the magic quality. Magic is when everything comes together to make a beautiful shot, and more often than not cannot be forced. I will sometimes have to give up a shot and try it again in different light or with a new design. If it's not working close to right away, don't waste too much time forcing magic. 5. Where did you study photography? At the University of Idaho. My degree is a B.S. in Visual Communication. 6. How much more did you improve your career after attending the school? Without school, I would not have any of this skill base. School was just the start, but a very important one. 7. Do you alter any of the photos with Photoshop? All my photos are edited with Photoshop. Much of my schooling was in digital editing as well, and those minor enhancements are very important. A good photo editor can tweak a good shot into one that is simply amazing. 8. How do you make the food look so delicious (mouthwatering) to your audience, making them want more? I produce what I love, maybe that heart is what makes my images work. Then again, I've had years of practice. So maybe its practice and passion together. 9. Do you enjoy your work? Why? Yes. I love my work. I still get excited over almost every shot just like I did 14 years ago when I started shooting (Ok truthfully, I hate photographing big round flat pizzas, but that's pretty much it). Maybe I even get more excited now because I know how to transfer the images and ideas in my brain into my photography exactly as I imagine them. 10. What determines the need to add gloss to a fruit or a plate of food? I'm really careful about glossing food. I try to keep my food as real as possible, even with my Photoshop edits. I will only gloss when something has lost its luster from cooling down too much. I brush a small amount of olive oil onto items like vegetables or meats when they start to lose their luster from me taking too long. 11. If there are any pointers that you could give an aspiring food photographer what would they be? Follow your heart, not trends. Go to the International Food Photography Convention in Boston that happens every two years. Practice, practice, practice, and shoot one meal a day if possible either at home or while eating out. Don't give up, I'm still learning like crazy and that's normal. Read food photography and food styling books. Shadow other food photographers and food stylists if possible. 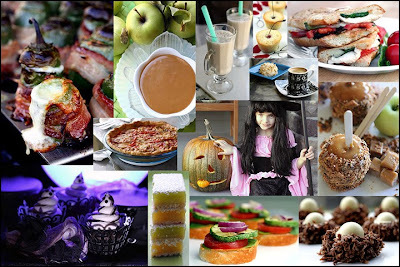 Read food blogs and food styling blogs. Start a food blog of your own and watch what makes people get excited, then go with it. Be real, never ever let ego get the best of you. Ego is the enemy to listening and learning. Cook yourself and get to know your subject inside and out. Treat everyone with kindness; it goes a long way in this field. Don't forget to thank everyone who has helped you, this has paid me back over and over. Most importantly, work to find your drive and passion. When you obtain that, most days will be creative and interesting because they are part of who you are. Laura, I loved reading this b/c it helped me see a little more of you and your journey and how you work. I'm a total dilettante when it comes to food photography and blogging but I like it that way for now. If I ever get serious, I'm sure I'll have lots of questions for you too! I'm starting to miss you like crazy on m/s, girlfriend. Will you please figure that Mac out before the withdrawel symptoms start? Thanks! :) Hope you're doing OK--I've been thinking about you. It's so wonderful to learn more about you and your path to success! Hi Laura, I really enjoyed reading your answers, somehow I feel that I can learn to take pics on my own...some day!! I just have to be patient, which is really dificult to me. I enjoy this kind of post because you show the other side of you! I am so looking forward to see you publish your own book some day. Did you get my email? What a wonderful interview - Congratulations Laura!! Great interview--it's interesting to find out how people get into food photography, styling etc... I always enjoy reading stories. Congratulations! What a great interview Laura! I found it to be very informative and I learned alot more about you, your past and your passion! You are fantastic at what you do, with the photography and the cooking! Lol@ Sue and Chef E... I will never be famous lol. Kathia I will go look for your email. It must have gotten buried in my billions of emails. Great job with this interview, Laura! Every bit of exposure you get is well-deserved. These answers are so encouraging and genuine, I'm sure the student really appreciated the advice. Once my trial is over mid-Spring, I'd love to really learn some basics of food photography and Photoshop as well. Thanks for the ideas in the interview. There is always so much to learn and I am glad for any help. Great to read a bit more about you Laura. Nice to know even the experts Photoshop :)! Wonderful read. Very insightful. Wish we could meet up for lunch sometime . . . Very nicely done! Thanks for sharing the interview with us. Lol Michelle you are a great photographer. I have no idea what I could teach you! Cristie it would be fun to have lunch with you! What a lovely story to read. I too have just found a passion for food photography so your words have given me some insight. Thank you. How refreshing to read this interview. My son is 19 as well, and just finished a photography class in college. His major is micro electronic engineering, but I suspect his passion for photography is equal. It is so rewarding when we can meld all of our interests into one. I love your work and congratulate you on your accomplishments as they sit beside your humbleness! Great interview, Laura. You are just good people. I like your thoughts on ego. One of my favorite things about your blog is you don't try to make it all about yourself, as too many bloggers do. You make it all about the things you love, but it is so infused with your great personality that we still get you. When is your cookbook coming out? I want one. Look at you interviewing for the big city paper! You deserve this and many other accolades. I have just embarked on what I hope will become a new career in food styling. Your photography inspires me to keep trying even when the hero looks beautiful but not great. Your advice is treasured and will be implemented! Cliff that was a really nice thing to say. Thank-you. Mari I have to go check out your blog. I need more food stylists in my life! Hi Diane, I had no idea you had a 19 year old son. That was neat to learn a little about him.